Denver-based cookbook author Jean Duane (Alternative Cook) is featured in the new Betty Crocker® Gluten-Free Cooking Cookbook with over 150 simple-to-make, quick and delicious recipes. This book will soon become your 'go-to' book for everything gluten-free. With a growing number of Americans correlating health problems with diet, gluten-free, allergy-free cooking is becoming more popular. Betty Crocker® Gluten-Free Cooking makes it easier than ever to make delicious appetizers, snacks, breakfasts, meals and desserts. Color photos of recipes and tips to customize the recipes to accommodate other allergies fill nearly every page. 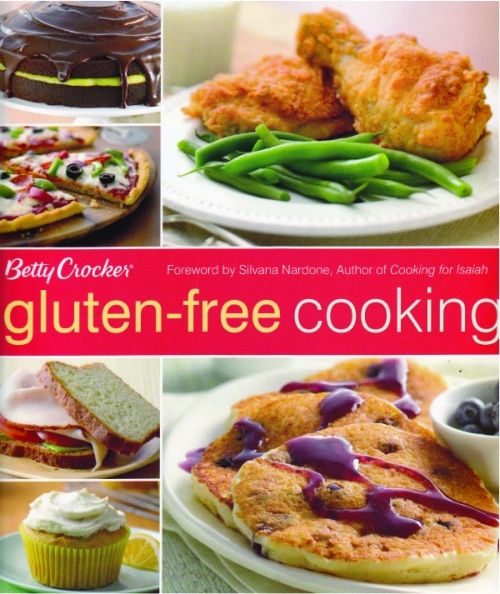 "I am thrilled to work again with the team at Betty Crocker® and to contribute so many gluten-free recipes to this fabulous book" says Jean Duane, Alternative Cook. Betty Crocker® Gluten Free Cooking includes mouth-watering favorites such as Gluten Free Quick Bread Mix, Sesame Crackers, Orange Cranberry Cinnamon Chex® Breakfast Bars, Waffles, Cheesy Vegetable Pizza with Fresh Basil, Gluten-Free Quick Bread Mix, Cinnamon Raison Bread, Applesauce Quick Bread, Gingerbread Molasses Flax Muffins, Chocolate Chip Muffins, Apricot Muffins with Almond Streusel Topping, Cinnamon Scones. Sandwich Bread, Sesame Seed Hamburger Buns, Poppy Seed Crackers, Cornbread, Dinner Rolls, Best Ever Banana Bread, Glazed Lemon Pecan Bread, Soft Pretzels, Gravy, Delicious Chocolate Cake with White Frosting, Chocolate Snack Cake with Creamy Butterscotch Frosting, Spicy Pumpkin Cake, Lemon Poppy Seed Cup Cakes with Lemon Buttery Frosting, Apple Pie, Luscious Meringue Lemon Pie, Strawberry Pie, Apple-Cranberry Crisp, Double Peanut Butter Cookies, Jeans Snickerdoodles, Nutty Chocolate- Chocolate Chip Cookies, Sugar Cookies, Lemon Wedding Cookies, Peppermint Frosted Brownies and much more. Working with the Betty Crocker® team was a terrific experience, says Jean Duane. Their professionals triple test every recipe, and then present the finished product to a five-person taste panel. Only the most delicious, easy-to-make, satisfying recipes make the cookbook cut. I am honored to have so many recipes in this book! Those with gluten intolerance often have other allergies to dairy and/or soy as well. Substitutions are a breeze with this cookbook. Allergic to dairy? Just substitute almond, rice, soy or hemp seed milk for cows milk. Instead of dairy-based cheddar or Swiss, use a substitute such as the products made by Follow Your Heart for cheese. Cant tolerate corn? Simply substitute any other grain-flour. The recipes will still taste great  without the allergens. Still need help with substitutions to fit your dietary needs? Please feel free to contact Jean Duane at www.alternativecook.com. Betty Crocker® teamed with Jean Duane, Alternative Cook and Everyday with Rachael Ray magazine editor Sylvana Nardone to offer an array of recipes that will excite even the veteran gluten-free cook with creative new ideas for meals, snacks and baked treats. It is a must-have addition to your recipe collection. Jean Duane, Alternative Cook, LLC produces full-length instructional DVDs (Chocolate, Mexican, Italian and Kids Meals), video streams (alternativecook.com) and Bake Deliciously! Gluten & Dairy Free Cookbook (available in paperback and ebook); and The Complete Idiots Guide for Gluten Free Cooking. Ms. Duane has produced several spots for Comcasts Video on Demand, made television appearances on PBS and has been a featured speaker at the 2009 and 2010 International Association for Culinary Professionals Conferences. Jean has developed recipes for Betty Crocker®, for Beautiful Sweets bakery and been featured in Better Homes and Gardens special Christmas Cookies 2010. Ms. Duane an instructor at Denver-based Seasoned Chef Cooking School. A regular speaker and magazine writer, she won Kiplingers "Dream in You" contest in 2006.